“We see growing evidence Apple will adopt NFC as a core part of its mobile payments strategy,” a new report from investment firm Morgan Stanley says — and evidence suggests that NXP has already won the contract to supply NFC controller chips for the iPhone 6. The analysts add: “Mobile payments is a major opportunity for Apple to improve user experiences and potentially add a new revenue stream. The company has historically been very good at integrating hardware and software, and we believe it can further differentiate itself and increase/preserve the value of its devices by adding services. “NXP is well positioned to participate in Apple’s mobile payments ecosystem,” the analysts conclude. “The company signed a licensing agreement with a customer in Q4 ’13, who we believe is Apple, related to its emerging ID business. A recent patent filing by Apple revealed potential use of NFC and secure element, which we think could be embedded. The patent Morgan Stanley refers to is US patent number 20140019367, “Method to send payment data through various air interfaces without compromising user data”. The patent was published in January 2014 and describes a system that uses a secure element in a mobile phone to store cardholder data, NFC to initiate a transaction and Bluetooth or WiFi to complete processing and return coupons and other information to a customer’s device. 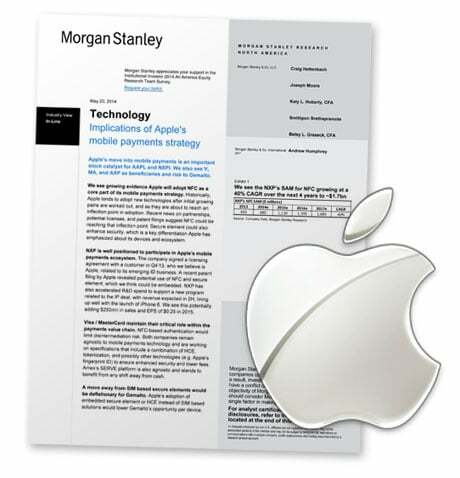 Morgan Stanley also discusses in the research whether Apple will use an embedded secure element or take a cloud-based host card emulation (HCE) route. “In our opinion, given the heightened focus on security after recent high-profile incidents such as the ‘Target breach’, we believe there is a good chance Apple may decide to go the embedded route, and perhaps incorporate a stacked NFC radio and embedded secure element solution such as NXP’s PN65,” the analysts say. Our best guess? Apple will use the secure enclave already built into the iPhone 5S’ A7 processor — currently used to store Touch ID fingerprint templates — rather than a separate secure element. This would then be used in combination with technology revealed in a February 2013 patent application that sets out a way to integrate NFC circuitry into the home button along with the existing fingerprint sensor.